This was not the devastating swagger Liverpool are so capable of but it was the kind of ultra-professional, hard-fought win that may well mean so much in this fledgling campaign as they threaten to mount a Premier League title challenge. 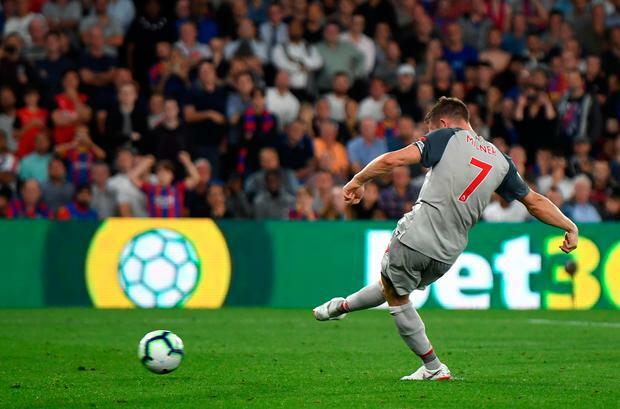 As professional, in fact, as the identity of their first goalscorer, James Milner, with the Liverpool captain converting the precious penalty that was so fiercely disputed by Crystal Palace. In injury time, Sadio Mane broke away to add a second. At the centre of the action, once again, was Mohamed Salah, who earned that kick amid accusations he dived and was also later fouled by full-back Aaron Wan-Bissaka, who was rightly sent off. But on this evidence, not many teams will come to Selhurst Park and beat Palace and just maybe, on the day that Liverpool sent Loris Karius on loan to Turkish club Besiktas, Liverpool would not have earned this result without their impressive new goalkeeper Alisson Becker. They confirmed they will be an even greater force this season. This game smouldered and then burst into life, with Liverpool claiming the lead on the stroke of half-time to the red-hot fury of Palace, who claimed that Salah had dived to earn the penalty after the ball had been played into him by Roberto Firmino. As Salah turned, he was clearly caught by former Liverpool defender Mamadou Sakho and, unbalanced, he eventually went over. 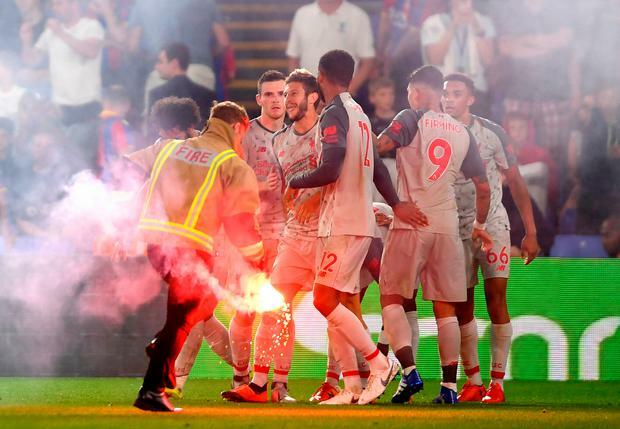 But it was that, the eventually, which so angered Palace and their manager Roy Hodgson, with Salah protesting his innocence as he was confronted by Sakho and another former Liverpool player, Christian Benteke. Milner stepped up and stroked the ball into the corner of the net. Seconds later the half-time whistle was blown by Michael Oliver and Salah was jeered with chants of "cheat" as he walked down the tunnel. It looked like poor defending. It looked like a penalty. It also capped a cracking first half. Palace had set up with a formidable game plan: to stay compact, hit on the break and try to make Liverpool force matters and overcommit. In turn, Liverpool pushed and probed, sending the ball from flank to flank in search of space, in search of forcing Palace out of shape with a brilliant one-v-one contest unfolding down the home side's right as Mane went up against Wan-Bissaka. On the other side, as Palace attacked, Trent Alexander-Arnold had his work cut out to contain Wilfried Zaha. Gareth Southgate, the watching England manager, may well have taken note of how both young full-backs were faring, as well as Joe Gomez, who would have gone to the World Cup if fit, and he did well to halt Zaha - one that got away for England, having declared for Ivory Coast - as he threatened to run clear. The challenge for Liverpool was laid out. Palace are a good, well-organised, dynamic side but the visitors should have gone ahead when goalkeeper Alisson, under pressure from Zaha, calmly passed the ball to Naby Keita on the left and he easily tricked Andros Townsend as the winger overcommitted. On the touchline, Hodgson, sensing the immediate danger, reeled away in frustration and Keita flighted a superb ball over the head of Sakho and through to Salah, who brought it down but could only lob his shot high over the crossbar. Townsend responded. He collected possession from Benteke and cut inside on his left foot to arc a shot beyond Alisson's grasp. The ball cannoned back off the cross-bar, with Zaha's follow-up blocked by Alexander-Arnold. Liverpool hit back themselves, as it ebbed and flowed more -rapidly. Salah's shot was charged down and the rebound fell to Keita, whose near-post effort was sharply turned away by Wayne Hennessey. Then Salah got in behind James Tomkins, hooking the ball back. It went over Firmino's head but fell to Andrew Robertson, who shot wildly over. The manner in which they went behind fired Palace up even more, but they almost conceded again when Alisson released Robertson, who bent the ball in from the left to find Salah. At full stretch he lifted it over the onrushing Hennessey who did well but could not turn it into the goal, cutting it back to Keita, who scuffed his shot wide. Salah had another opportunity with the ball dropping to him from a corner, only for his goal-bound half-volley to be headed behind by Jeffrey Schlupp. Again Palace had responded with Zaha setting off on a powerful, mazy dribble to draw a foul and a booking for Alexander-Arnold. Luka Milivojevic took the free-kick, but Alisson reacted smartly to punch the ball away as it threatened to curl inside his near post. Liverpool were being tested. 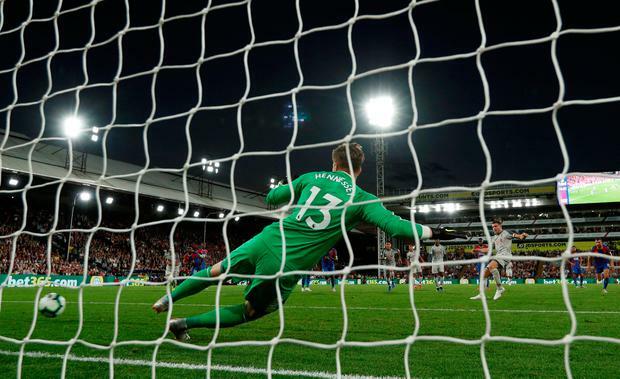 Patrick van Aanholt hacked a shot wide and Benteke forced another good save from Alisson with a header, although Zaha was pulled up for offside. Benteke had another chance but mis-hit his shot and Hodgson decided he had seen enough. On came Alexander Sorloth, another big striker, to replace the Belgian. The ball sailed over his head in his first involvement, but dropped to Zaha, who shot straight at Alisson, looking every inch the commanding keeper Liverpool have craved. It meant Palace were vulnerable to the counter-attack and they suffered when Firmino played through Salah. Wan-Bissaka tried to stop him, but brought down the Egyptian on the edge of the penalty area as he threatened to run into it. The red card was shown to the 20-year-old, before Salah's free-kick deflected over. Soon after and Hennessey tipped over a Salah header.